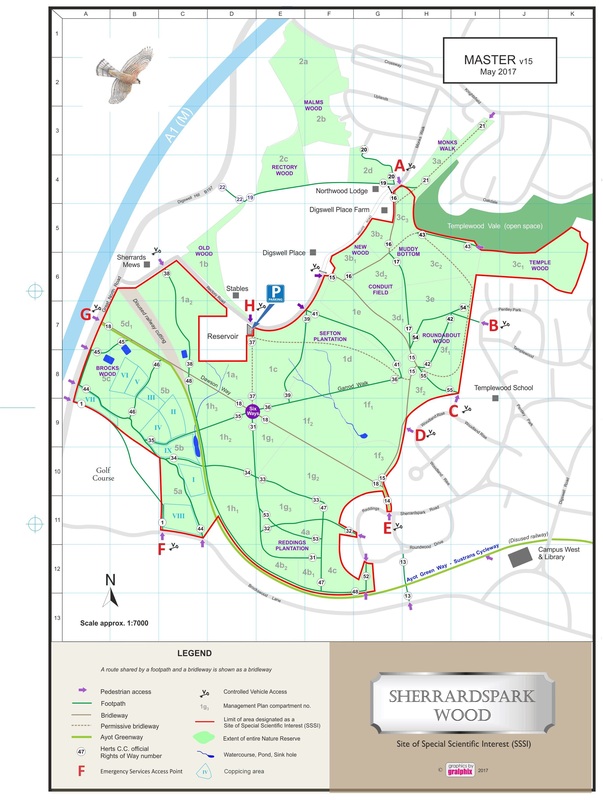 Sherrardspark Wood is an ancient woodland of 75 hectares bordering the north west edge of Welwyn Garden City in Hertfordshire and is one of 8 Local Nature Reserves owned and managed by Welwyn Hatfield Borough Council. The recorded history of the wood dates from The Domesday Book. Its importance as an outstanding example of sessile oak and hornbeam woodland in the south east of England was recognized when it was designated a 'Site of Special Scientific Interest' (SSSI) in 1986. The Sherrardspark Wood Wardens' Society was formed in 1966 to help protect the Wood from the pressures of an ever expanding Welwyn Garden City. The Society is largely self-funding and has a trained work force of around 60 volunteers. Today, the members actively manage the wood in conjunction with the Borough Council to re-establish its historic character, and also independently run programmes to monitor the varied wildlife. The Wood, which is crossed by many footpaths and bridleways, is also an amenity much used by the public - walkers with or without dogs, joggers, cyclists, horse riders and people who simply want to spend time in a beautiful place. Click here for a more detailed map. The local community - schools, outside groups and the general public - is regularly updated with the latest information concerning the wood through articles in the local press and programmes of guided walks and talks. To welcome the arrival of the new year we have published our 2019 guided walks programme. The walks, which take place between March and October, are a great way to get to know more about the woods and to enjoy the spectacular seasonal changes which happen through the year. For full details see our guided walks page. 2018 was a very busy and productive year for Sherrardspark Wood Wardens, volunteers who work hard to ensure the safe and healthy future of the woodland and wildlife habitat. 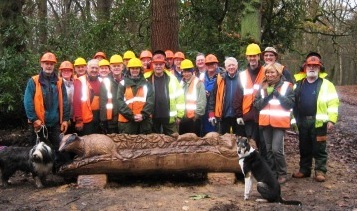 Our activities included major programmes of clearing and replanting, wildlife monitoring, erecting and repairing benches, guided walks led by experts and visits to help at other local nature sites. Every autumn during our dormouse box survey we normally expect to come across nests of wood mice (Apodemus sylvaticus) or yellow-necked mice (Apodemus flavicollis). This year has been notable for their total absence. We were, however, pleasantly surprised to discover two separate multiple roosts of brown long-eared bats (Plecotus auratus) during the September 2018 survey.